In order to get an answer to this question, I turned to Julien from the blog Purple Belt Kitchen. Coming from the city of Thonon-les-bain (a wonderful city bordering a lake in the Alps mountains), the purple belt writes articles full of advice and recipes dedicated to jiu-jiteiros. For that collaboration I appealed to his knowledge about naturopathy, nutrition and plain health to concoct us a special “time of the month” recipe. Naturopathy and Brazilian jiu-jitsu: what’s the connection? First let’s see what naturopathy is. According to my dictionary “it’s a set of treatments which belongs to alternative medicines and which aims to reinforce the organism immune defense system with ways considered as natural (living hygiene, nutrition, phytotherapy, massage etc.)”. Instead of treating the symptoms, naturopathy acts upstream, preventively and with a customized way. Because Julien practices Brazilian jiu-jitsu, he knows our pains and issues perfectly. He knows how to prepare us recipes which will help us manage our training and preparation. So it’s time for Julien to give us more details and tips. Which factors increase the premenstrual syndrome ? What are these symptoms due to? Nobody really knows but we can deduce that it is because of the hormonal fluctuation, the sudden oestrogen decrease while there’s an progesterone increase then decrease in absence of pregnancy. It’s a bit weird, I agree. Let’s make PMS tap with a flying armbar? So why not? BJJ might help you if you practise it 3 to 5 times per week. It’s the kind of necessary effort to have an impact on this syndrome but you should also change some of your eating habits ! What should we avoid to eat to limit the premenstrual syndrome effects? To begin with, put aside coffee, aperitif, sodas and other sweet drinks. Yes, even your papaye-guava drinks with 15g sugar per 100ml. Drink water and herbal tea. I already hear “Marie-Laure! Who is the bitter guy you let write on your blog?! You can’t let him do that! He wants us to stop to give ourselves a treat!!!”. I love you women! I sincerely only want to help those of you who suffer the most from PMS. In your dish, you will have to slow down with salt (conserve food, ready-prepared dishes, restaurants…) and with high glycemic index food : potatoes, white rice, pasta, bread, pizza… Instead consume food with a low and average GI and including food with fiber like fruits and vegetables, leguminous, whole cereals. It’s also necessary to get your fill of omega 3, magnesium and calcium. I also advise against eating dairy products. You’d better look for calcium in green vegetables (cabbage,broccoli, spinach). It might be a lot to change for some of you but it might be worth trying for a time, to see what it is to feel good. I invite you to do more research to deal with these kind of food deeper. However I won’t let you without an anti-PMS recipe. 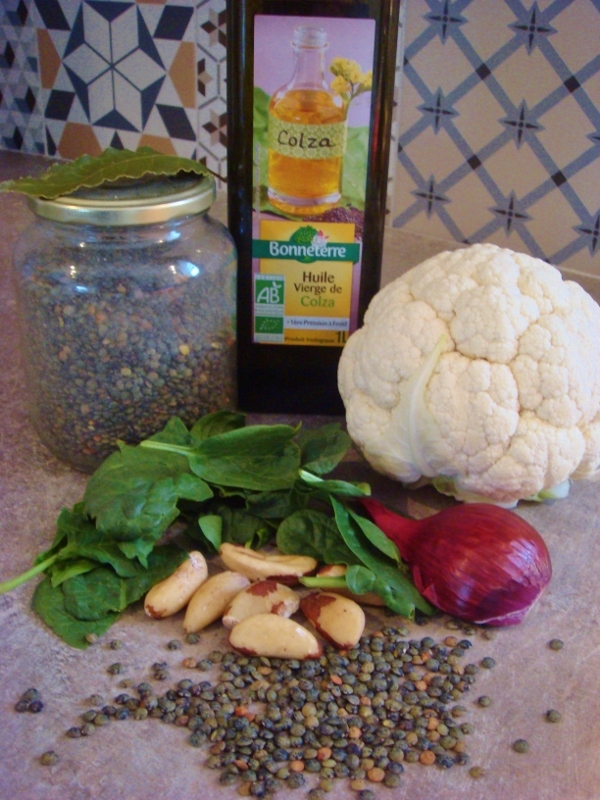 We will use green lentils which are rich in mineral salts, fibres, vegetal proteins and have an average glycemic index ; sage which is a good menstrual cycle regulator ; cauliflower rich in calcium ; rapeseed oil which has omega 3 ; Brazil nuts (special mention!) rich in magnesium. Well everything is here to help you! Pour the water into the pan, add the lentils, the sage leaves and bring it to the boil. When it boils, reduce heat to medium and add the onion you already chopped finely and let it cook 10 minutes. 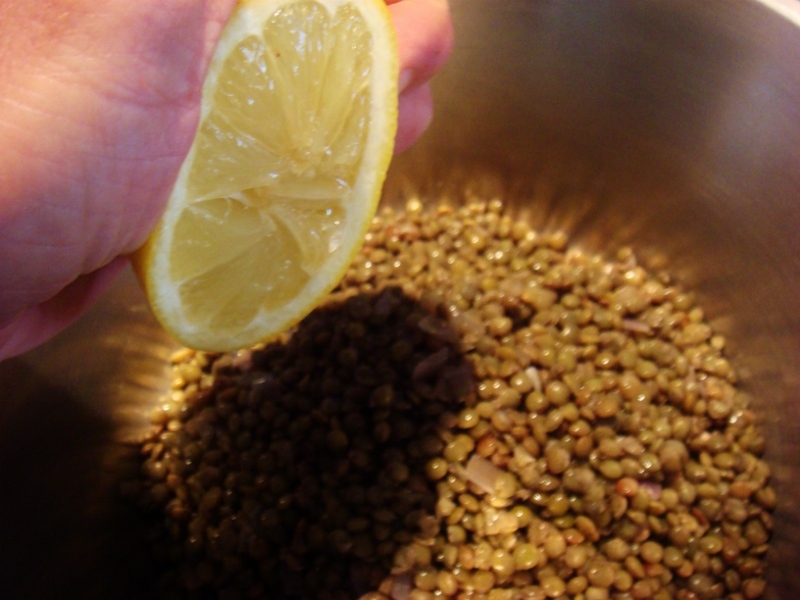 Dry the lentils, pull out the sage leaves and let it cool down. 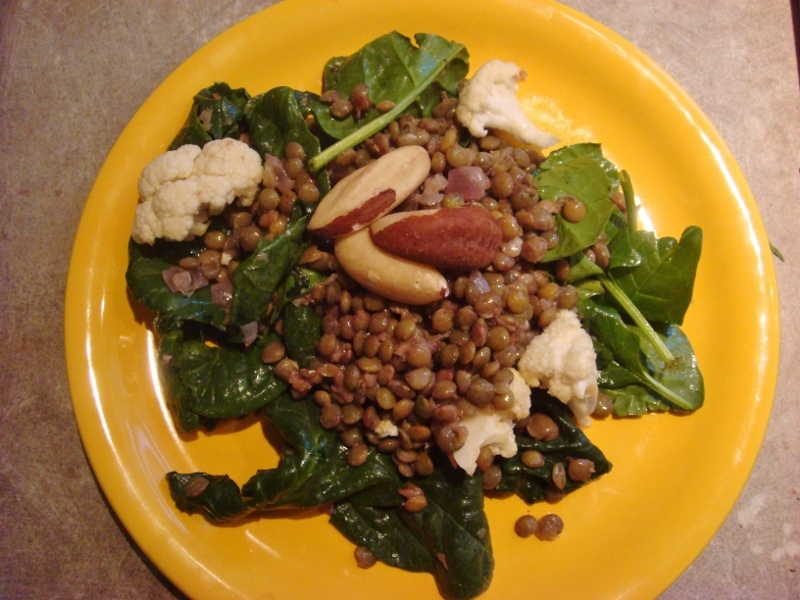 Put lentils, spinach, oil and lemon juice in a salad bowl. 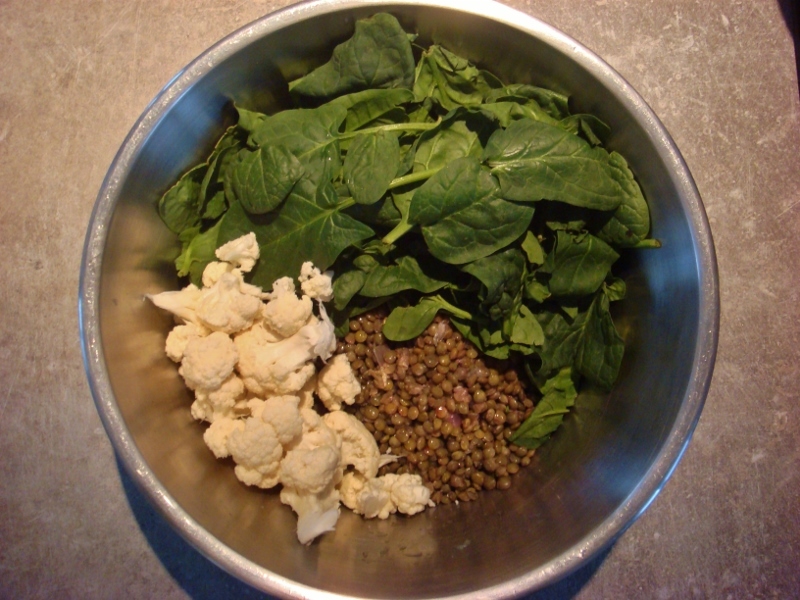 Chop the cauliflower in small pieces and add it to the salad bowl then mix everything. Serve it directly or cold. Thanks Marie-Laure for the opportunity to write on your blog! I hope you appreciate this precious advice. Many thanks to Julien for this partnership!